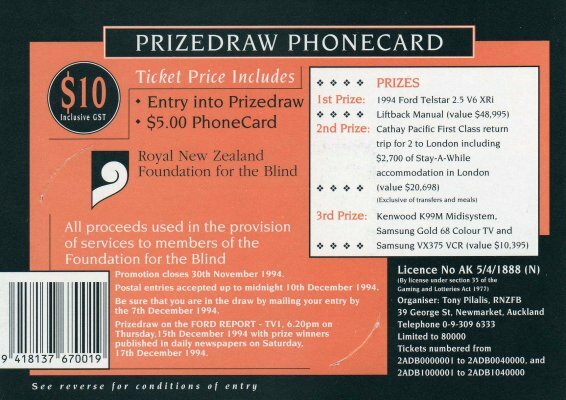 The two cards were sold as a raffle ticket attached to the card illustrated below. For the cost of $10, you got $5 worth of phone calls and an entry into the prize draw. 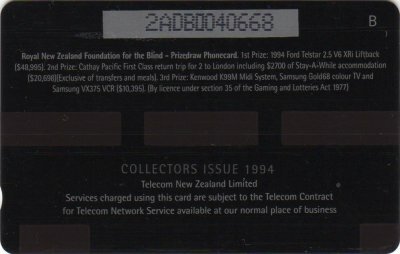 Your ticket number was the serial number of the card. These cards were also included in the Collector Pack AdCards Volume Seven NZ-CP-32 and were overprinted on the reverse with Collectors Issue 1994 or International Collectors Issue 1994, if inserted in the International Pack. Reverse of the two normal cards.